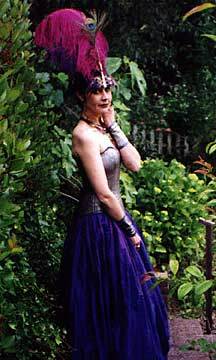 Valentine Victorian corset in reptile-embossed metallic lambskin with coordinating collar and gauntlets, worn with a full multi-color skirt of metallic silk organza. Fairy Queen and her consort. 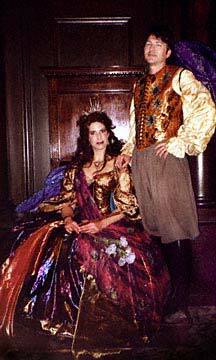 He is wearing a crocodile-embossed leather doublet with metallic leather appliqués over a brocade poet's shirt and corduroy breeches; she is wearing a metallic reptile-embossed pointed underbust Victorian corset with multi-colored tissue lame and metallic silk organza skirts and blouse. Both have custom-made wings. 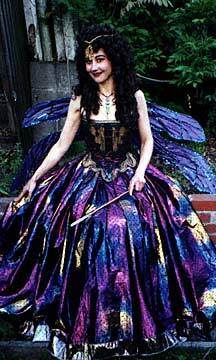 Dragonfly gown of iridescent taffeta embellished with gold cording, metallic lame, and jewels. The gloves have metallic "claws" and the headpiece is jeweled to produce a bug-eyed effect. A custom-made dragonfly neckpiece completes the ensemble. 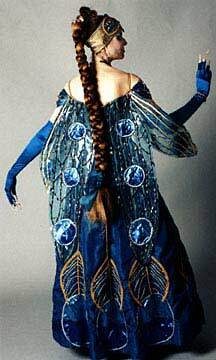 Dragonfly gown - back view. 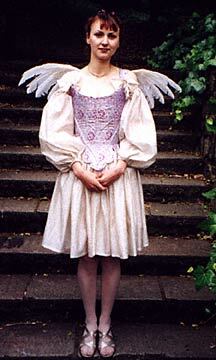 The detachable wings are mylar covered with sheer organza, accented with gold braid, sparkling jewels, and tissue lame. 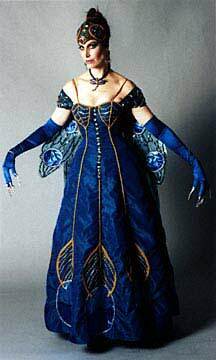 The buttons which attach the wings to the gown are in the form of iridescent cicadas. 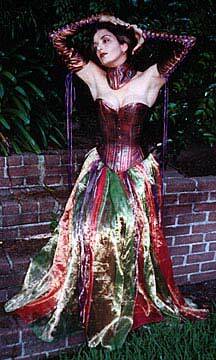 Holographic PVC Valentine Victorian corset with matching cuffs, worn with iridescent ballgown skirt Fairy ensemble of rainbow iridescent lame with an embellished Renaissance corset bodice and coordinating wings. Valentine Victorian corset of snakeskin-embossed patent leather, trimmed in black, worn with PVC gauntlets and circle skirt 18th century lavender silk corset with crinkle organza skirt, detachable sleeves and feathered wings.